Silverado Springs - You Don'T Want To Miss This Gem. MLS#2083357. Allure Realty Group LLC. Canyons - Partial strip views from the loft. No home behind you! MLS#2083426. LUXE Estates & Lifestyles LLC. 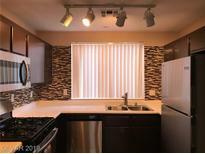 Belle Esprit - Stainless steel appliances, Wood-Look Tiles, Kitchen backsplash, Two-Tone Paint. MLS#2083453. Nevada Real Estate Corp.
Amigo - Buyer to verify schools and all info in this listing. MLS#2083161. Hecker Real Estate & Develop. Spencer Pyle - American West home built in 2000. MLS#2083602. American Guardian Realty. Central Park - Community Amenities include Playground, clubhouse, Putting Green & More! Close to new Raiders Stadium!! ! MLS#2083053. Robinson Realty & Management. Crystal Springs - Just right for the first time home buyer or someone downsizing. MLS#2080734. Signature Real Estate Group. Silverado Courtyards - Park area is located in the community and extra parking throughout. Welcome home! MLS#2082856. Urban Nest Realty. Enclave - Minutes from the Strip & Raiders stadium. Additional upgrades list available. MLS#2081923. Century 21 Americana. Ebbets Ranch - Kitchen renovation. Master Bath renovation. Welcome Home... MLS#2082782. Local Realty. Maryland Pebble - Relax in the beautiful backyard with a built in bbq and covered patio with terracotta tile. Solar energy. MLS#2082510. Realty ONE Group, Inc.
Silverado Ridge - Pool, Jacuzzi, Covered Patio, Custom Pool Deck Make For Spectacular Entertaining! View This Gem Today. MLS#2082187. 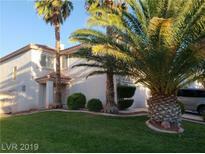 Compass Realty & Management, L.
Silverado South - Conveniently located close to schools, shopping & freeways MLS#2082584. GK Properties. Canyons - Beautiful open floorplan, granite counters, upstairs loft, one bedroom downstairs with full bath, formal dining and living room, huge master bedroom upstairs, close to schools and shopping.You will love it. Propety sold as-is. MLS#2081974. Paradigm Realty. Buckingham Estates - !THE OWNER JUST SPENT OVER $40K IN UPGRADES.UPGRADES INCLUDE NEW GRANITE COUNTERTOPS,NEW CABINETS,NEW PAINT INSIDE & OUT,STAINLESS STEEL APPLIANCES AND MUCH MORE.PREVIUOSLY USED FOR ASSISTED LIVING BUT CAN BE USED AS A PRIMARY RESIDENCE.SIMILAR HOUSE ACCROSS THE STREET IS CURRENTLY UNDER CONTRACT FOR $465k.A MUST SEE TO APPRECIATE! ! MLS#2082168. Compass Realty & Management, L.
Grande Point - Property is at convenient location close to strip, airport, freeway... MLS#2082325. Luxury Homes of Las Vegas. Aspendale Silverado - We May Be Able to Have Them Sign New Lease Agreement. Rent is $1375 per Month. MLS#2082685. Realty ONE Group, Inc.
Maryland Le Baron - Beautiful 2 Story In Desirable Silverado Ranch, 3 Bed, 2.5 Bath * 1 Car Garage + 1 Side Parking Spot * Kitchen With Breakfast Bar * Dining Area And Spacious Family Room Downstairs * Ist Floor Laundry Area * All 3 Bedrooms Upstairs * Master Bed W/ Walk-in Closet And Tub/Shower Combination Master Bath * All Appliances Included * Silverado Lane Community Offers A Swimming Pool, Park And Low Monthly Hoa! Hoa Covers Front Landscape Maintenance. MLS#2081936. RE/MAX Unlimited. Canyons - *kitchen Features Granite Counters, Stainless Steel Appliances & Pull-out Cabinets*dramatic Ceilings*abundant Natural Light*anderson Doors*plantation Shutters Throughout*bedroom & Bath Downstairs*rv Parking*located At End Of Cul-de-sac! * MLS#2081765. Black & Cherry Real Estate. Crystal Springs - This Nice Sized Property Is In Good Condition And Features Center Island Kitchen, Granite Counters, Stainless Steel Appliances, Ceramic Tile Flooring, Shutters, Built-ins In The Closets, High Volume Ceilings In Living Room, 5 Bedrooms Plus A Loft And 3 Car Tandum Garage. A Must See! MLS#2080283. Investpro Realty. Silverado Courtyards - Owner has only occupied home since December 2018. Still smells new! MLS#2081957. Executive Realty Services. Cactus Maryland Seasons - Smart-home features include Smart Locks, Security System & Smart Thermostats. MLS#2081370. Prominent Realty Group LLC. Lamplight Gardens - Community pool & spa, basketball court, playground, and much more! Truly a MUST SEE! MLS#2081753. Simply Vegas.